The FieldScout TDR 100 Soil Moisture Meter from Envco Environmental Equipment uses TDR technology to provide accurate soil moisture measurements from a range of soil moisture conditions. It can be used in a variety of circumstances, such as in a field, greenhouse, or laboratory. This soil moisture meter is available with two probe sizes: 12cm or 20cm (4.8in or 8 in). It has an LCD interface that displays two sources of information: volumetric water content and relative water content (irrigation management mode). 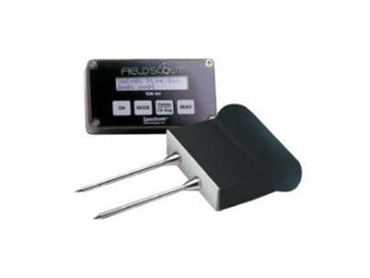 The FieldScout TDR 100 Soil Moisture Meter provides measurements of soil moisture conditions in less than one second. It has an easily portable, hand-held design and can be stored without difficulty. Units are connected by a 5ft. cable. Measurement rods are available for purchase separately for Field Scout TDR products.